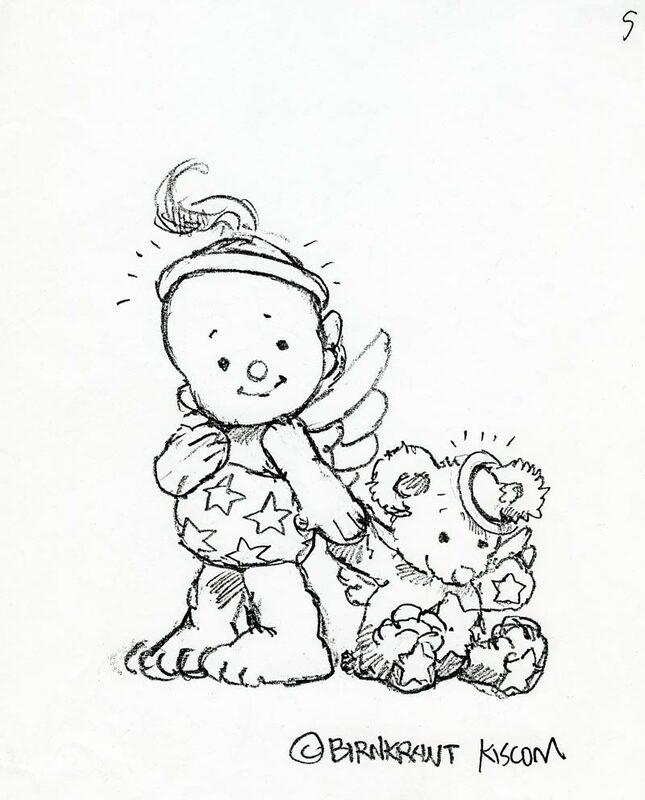 I never bothered to color these images, as even then, I realized that Angels, no matter how adorable, didn’t stand a chance of being made. No major toy company would be so brave or foolhardy, as to undertake a line of dolls with a seemingly religious theme. Therefore, because there was no point in showing this concept to my partners, I put these seven drawings away. I regarded them as merely an exercise in wishful thinking, and never saw them again, until yesterday. How, or why I happened to stumble across them is a mystery. They came as a surprise to me; admittedly a pleasant one. I really rather like them. 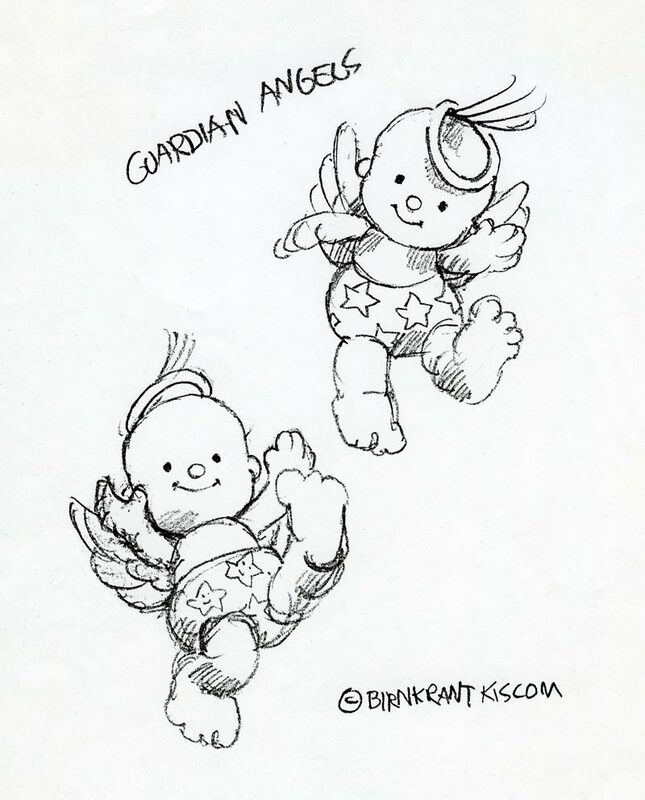 If I had my own toy company, I would manufacture these Guardian Angels in a heartbeat. In this hi-tech electronic age, they might be just the sort of toys that the World needs. Each Guardian Angel would have a halo, placed kind of casually cockeyed, as if it was kept there merely by a lock of hair. 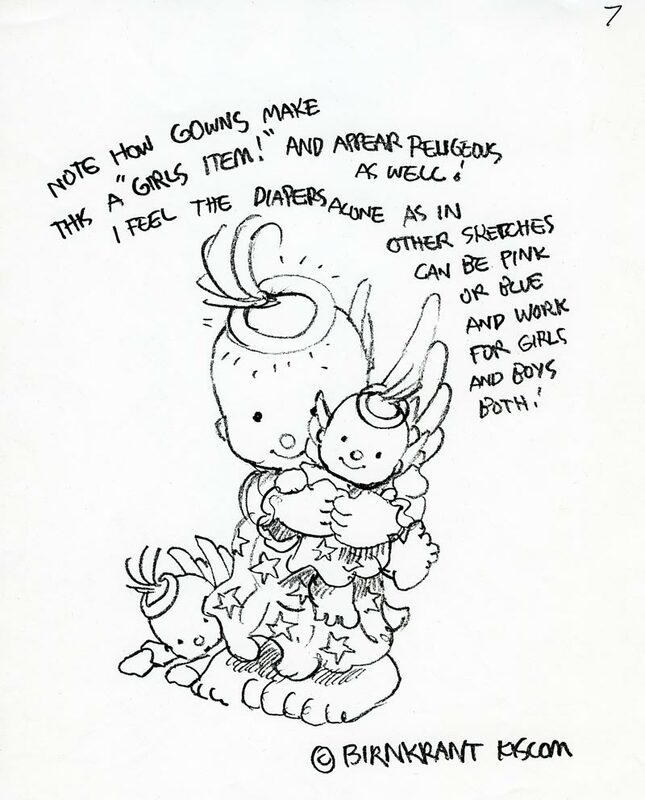 And every one would have a pair of iridescent wings, and a diaper, colored either blue or pink, with bright white stars that glow in the dark. 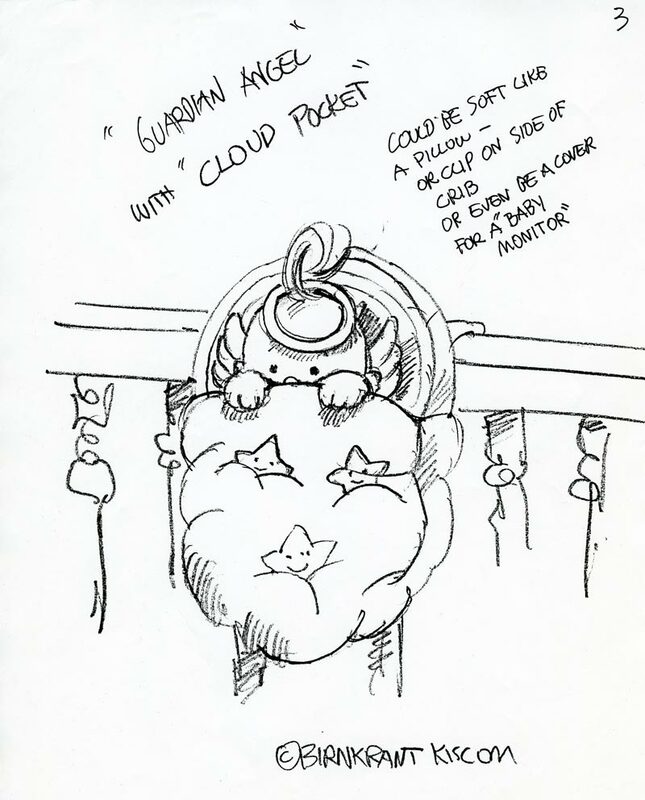 This soft Cloud Pocket could fasten to the rail of a baby’s crib. 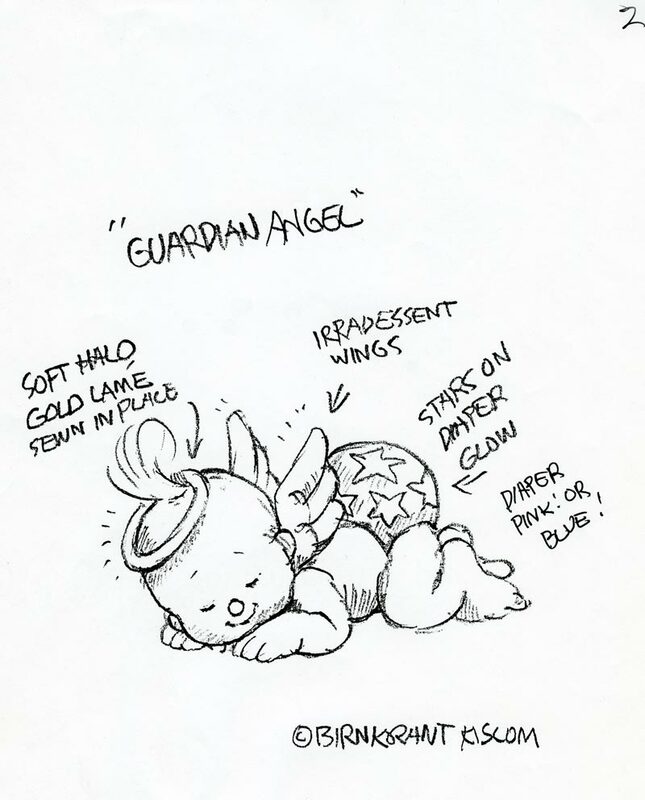 It is a safe cozy place, from which his or her Guardian Angel can watch over the sleeping baby. 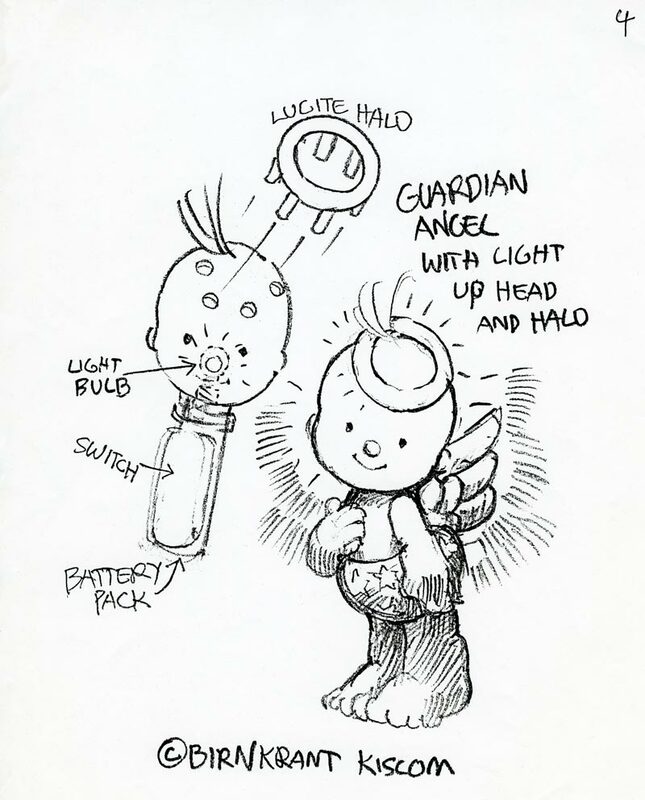 This drawing illustrates a possible light up feature. There would be a battery and switch in each baby’s tummy. The light bulb would be inside its vinyl head. A Lucite Halo would plug into a series of holes. The Lucite rods would pick up and amplify the light to make the halo glow. This Guardian Angel has his own Guardian Angel Teddy Bear that follows him everywhere. Here is a Guardian Angel Family, an Angel Baby, an Angel Kitty and an Angel Puppy. 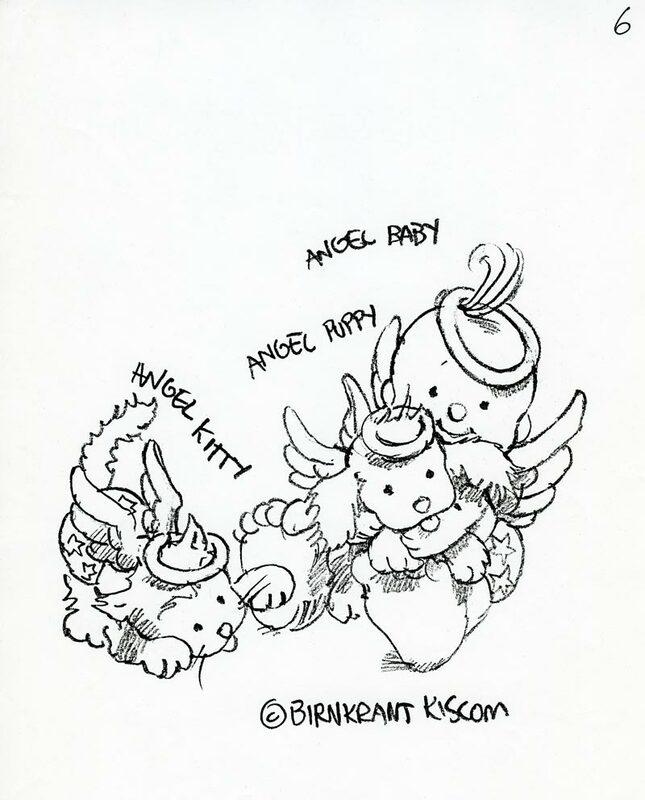 The line might expand to include an entire Angel Menagerie. This Guardian Angel wears a long angelic gown, and has her very own Guardian Angel dolls. Looking back now, I regret jumping to the conclusion that a concept like this could not succeed. I wish that I had made a model. The novelty of a light up halo might have been just enough to overcome the controversy of a religious theme. Thirty years ago, I didn’t believe in miracles: these days, I do.